For the past few days I’ve been bringing my parents’ dusty cd music collection back to life by converting them to mp3 for their computers. 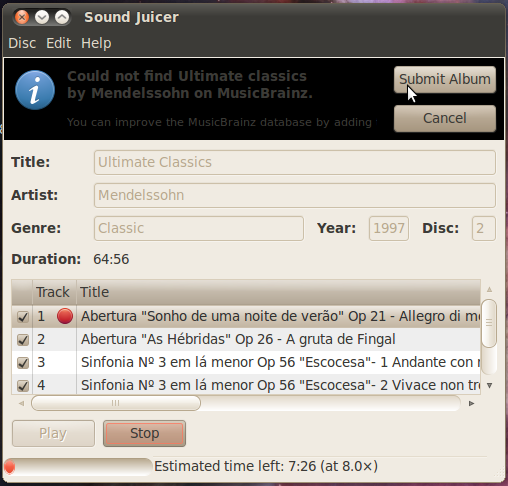 While its a bit of a task, GNOME’s Sound Juicer makes it a breeze. Sound Juicer 2.28.1 in action.. Though Sound Juicer isn’t an all-in-one ripping and management tool, it is very good at the ripping! For the management and editing of IDv3 tags I would suggest you try EasyTAG which is available via the Ubuntu Software Center or here. With Sound Juicer, you’re able to rip the contents of a cd in most cases with a single click and no editing since the details for the disc are retrieved from the internet. You can also add information such as disc number, year and genre if you wish. If you’d like to add more details, like I do such as album art, you may consider using EasyTAG which makes this process a snap. Sound Juicer doesn’t have a lot of preference options, but you are able to control the format that your music is copied to, being MP3, OGG or what ever your preference may be. You can also easily stripe special characters and control the hierarchy of the folders that your music is output to. While Sound Juicer may be a tool that is only needed on rare occasions and may never be needed for a second time, it remains to be very impressive with what it does and should find a way into your accepted tools for this sort of task. I’ve used it for hundreds of CDs over the years. Hasn’t failed me yet! Is there anything new about it? I’m not aware of anything new in it, but I’m new to Sound Juicer and was thoroughly impressed with its ease of use and success rate. Just thought I’d pass along the tip! Do you use any other programs to manage your music? Oh alright… it was something so common to me that I was confused! Well for years I used Amarok until the latest KDE4 releases came out. (well JuK was my first player on Linux). Then when I more recently came to GNOME, I started using Banshee. When Ubuntu finally added support for my iPod Touch I’d recently got, I switched to Rhythmbox where I am today!